From a rocky point that extends into Walker Bay, I sat only a few yards from a Southern Right Whale mother, with her calf. In September of 1998 I read and article in the Honolulu Advertiser. It pertained to an annual Whale Festival held in Hermanus, South Africa from September 24th through October 2nd. The article went on to say that Hermanus prides itself of "Shore Based Whale Watching only". I could not believe this. I immediately made contact with those in South Africa. Due to my life's work of more than 25 years here in Hawaii, I was invited to Hermanus, South Africa as the Guest Speaker for the 1999 Whale Festival. Hermanus lies about 80 miles east of Capetown bordered by the Atlantic Ocean, and Walker Bay. I myself must admit to the fact that I always thought of Capetown as being the Southern most point of South Africa. Not so, as Capetown lies several hundred miles west of Cape Agulhas, the southern tip. South Africa, also known as the Western Cape has a Mediterranean climate. Crop producing farms are so large they are referred to as states within themselves. The Garden coast route, which extends from Capetown towards Port Elizabeth on the eastern portion of South Africa, is absolutely beautiful. Miles of deserted sand beaches rugged coastline and what can be a very furious sea. Two very fast moving currents meet head to head along the southeastern portion of South Africa. The Agulhas (warm) current from the Indian Ocean, and the Benguela (cold) current from the Atlantic Ocean. Along this rugged coastline Southern Right Whales and Humpback Whales can be seen from July through October, arriving from Antarctica to mate and give birth. One such area is Walker Bay of Hermanus, South Africa. The Southern Right Whale was given its name because it was simply the slowest whale, and the carcass floats when dead because its body is so rich in oil. The body is stocky and fat compared to a Humpback Whale. They grow to a larger size and have a thicker blubber content than the Humpback. Hermanus is a beach town about the size of Hermosa Beach in Southern California. It is bordered by Walker Bay of which if you were familiar with Maui, Hawaii would extend approximately from Lahaina, to La Perouse Bay. Arriving in Hermanus I reflected upon the 1950's and my younger days of living on board a sailboat on the offshore waters of Maui. This was a time when whale sightings were numerous from early November through May. I remember walking the beaches of what is now the Kaanapali Resort area, with Humpback whales lying only a stone's throw from the shoreline. From the rocky points of Walker Bay, or park benches that line this coastal area of Hermanus, families view the Southern Right Whale in Natures way, peacefully and with respect. From the rocky points of Walker Bay I, along with dozens of families, became mesmerized and said not a word as Southern Right Whale mothers and calves touch and caress each other for hours. Nature had taken its hold upon us by sharing a very special moment in time with one of the largest species on earth. From time to time I would hear young children whispering to their parents with questions or thoughts of what it must be like to be a whale. South Africa was a very heartwarming experience for me. Unlike my home on Maui, Hawaii, and many of other places in the world, dozens of whale-watching boats take hundreds of people out to view the great leviathans. On board these boats people are packed in like sardines, yelling and screaming at the sighting of whales. Competition of whale-watching boats I believe has eliminated frequent near-shore sightings, along with thrill-craft operations (jet skis and Parasail boats) that are permitted to operate from May 15th through December 15th. And once again Nature takes a smaller cut of the pie. No Whale Watching Boats is what Hermanus, South Africa can be proud of. This is a place where nature has been given the entire piece of the pie, and mankind prospers through this balance. During the day people enjoy the Whale Festival, which includes arts & crafts, music and theatre. From the sidewalks and restaurants one can look down on Southern Right Whales lying peacefully along the coastline. Information pertaining to the Southern Right Whale can be found in the small whale museum or from the Whale Crier. This individual carries a horn made from seaweed, and a plaque which shows certain areas of the bay. Each location or area has its code. Depending on the long and short blows of the Whale Criers horn somewhat like and SOS code, you can tell where whales are being sighted along the coast. It took Hermanus, South Africa to rekindle my faith in mankind. Something I am loosing, living here on Maui. More whale-watching boats advertising guaranteed sightings or your money back. Helicopters buzzing pods of whales and whatever other circus can be made from exploiting nature. "It not only takes a long time of watching the animal before you can say what it is doing; it takes a long time to learn how to watch". 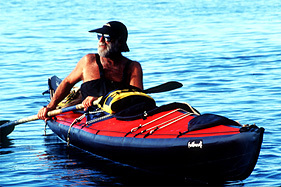 Since 1975 I have spent more time at sea in my kayak than I have with my own species. Being with the nature is so much more satisfying and simple. Everything lives in balance and harmony. Living as I do with nature becomes frightening when eventually I must come back to land. I too after all these years have become very fragile, yet strong in living with the Natural elements. Days and nights are spent in my kayak, as I drift between the Hawaiian Islands of Maui, Molokai, Lanai and Kaho'olawe. Eating, sleeping and breathing with Nature in Natures way. Frequent near-shore sightings of the North Pacific Humpback Whale have changed. According to the Hawaiian Islands Humpback Whale National Marine Sanctuary Environmental Impact Statement, numerous whales are now being sighted in the more remote areas of the Hawaiian Islands. Makes sense to me, Hawaii is where they come to mate and give birth. I too would look for a place of peace and quiet. Nature is not a game. In Hermanus, South Africa it is a way of life. Leave this species alone and it will be here for generations to come.